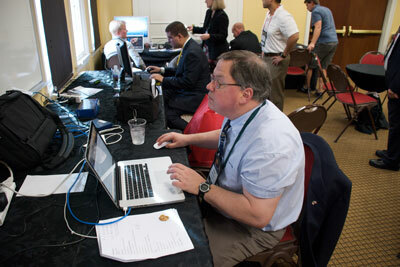 Former editor Randy Attwood working at the National Space Symposium. SpaceQ Media Inc. is a privately held media and market intelligence company headquartered in London, Ontario. 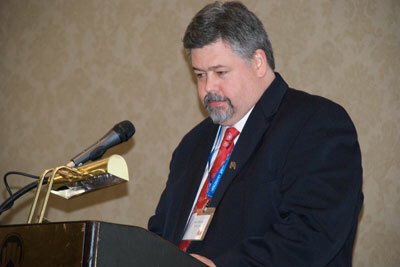 SpaceQ was formerly known as SpaceRef Canada, and was developed by founder Marc Boucher. SpaceQ maintains an affiliation with the SpaceRef network of sites which includes SpaceRef (USA), launched in 1999, NASA Watch and the Astrobiology Web, both launched in 1996. It takes of team of talented people to make SpaceQ. Meet the growing team. Founder Marc Boucher moderating a panel at the Canadian Space Summit. SpaceQ is currently looking for reporters as it expands.